Our Kyriad hotel warmly welcomes you to the Pays basque and Landes regions. We are located about 1.5 miles from the city center of Dax, a spa town with a hot fountain in the square. We are just over a mile from the SNCF train station, 1.5 miles from the the Grand-Mail shopping center of Saint-Paul-lès-Dax and 38 miles from the Biarritz Airport. Come enjoy the charm of Landes forests and beaches (Vieux-Boucau, Cap-Breton and Hossegor), just 30 minutes away by car. Whether you are here for business, a weekend getaway or family vacation, our hotel is open 24 hours a day. For your seminars and training sessions, we have 4 fully equipped meeting rooms. During your stay in our modern hotel, you can enjoy the large leisure complex next to the hotel that includes 2 restaurants, a casino (César Palace) and games room. You can also enjoy spa treatments at the ancient Roman city or take part in the Dax Féria or the Torros y Salsa Festival. Go out and explore Saint-Paul-lès-Dax, the city that organizes the European Circus Festival, with its rugby club, museums, cobbled streets and magnificent cathedral. 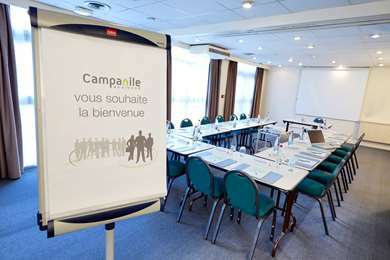 Hotel Kyriad Dax – Saint-Paul-lès-Dax offers rooms that can accommodate from 1 to 3 guests, and connecting rooms for families. The hotel is wheelchair accessible and has two specially adapted rooms (large bed, raised toilet, bathtub with grab bars). All our rooms are equipped with a private bathroom with tub or shower and hair dryer, a flat-screen TV with Canal+ and 3 satellite channels, free Wi-Fi, a desk, a phone and a courtesy tray with a kettle, tea and coffee. Every morning, the hotel offers its very complete all-you-can-eat breakfast buffet. Come make your own breakfast rich in flavors and vitality.